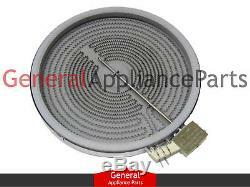 Maytag KitchenAid Jenn-Air Range Radiant Heating Element AP6018366 PS11751668. Whirlpool Maytag Amana KitchenAid Jenn-Air Admiral Roper Inglis Viking Crosley Imperial Modern Maid Speed Queen Jade Kenmore Sears. Most modern electric ranges have a ceramic glass-top surface, which has replaced the now-outdated metal coil cook-top. Rather than being located on the surface, the burners are hidden under the glass. Reinstall the burner, then reassemble the range by reversing the steps you took to disassemble it. AER5844VAB0 AER5844VAB1 AER5844VAD0 AER5844VAS0 AER5844VAS1 AER5844VAW0 AER5844VAW1 AER5844VCB0 AER5844VCB1 AER5844VCB2 AER5844VCS0 AER5844VCS1 AER5844VCS2 AER5844VCW0 AER5844VCW1 AER5844VCW2 AER6011VAB0 AER6011VAS0 AER6011VAW0 G7CE3055XB00 G7CE3055XS00 G7CE3635XB00 G7CE3635XB01 G7CE3635XP00 G7CE3635XP01 G7CE3635XS00 G7CE3635XS01 G9CE3065XB00 G9CE3065XB01 G9CE3065XS00 G9CE3065XS01 G9CE3074XB00 G9CE3074XS00 G9CE3675XB00 G9CE3675XB01 G9CE3675XS00 G9CE3675XS01 GY397LXUB03 GY397LXUQ04 GY397LXUS03 GY399LXUB03 GY399LXUQ05 GY399LXUS03 IES426AS0 JEC3536BB00 JEC3536BS00 JEC4530YB00 JEC4530YS00 JEC4536BB00 JEC4536BS00 JEC4536YB00 JEC4536YS00 JES8850CAB01 JES8850CAF01 JES8850CAS01 JES8850CAS02 JES9800CAB01 JES9800CAF01 JES9800CAR01 JES9800CAS02 JES9900CCB01 JES9900CCS00 JES9900CCS02 JES9900CCW01 KECC602BBL00 KECC602BSS00 KECC605BBL00 KECC605BPW00 KECC605BSS00 KECC662BBL00 KECC662BPW00 KECC662BSS00 KECC667BBL00 KECC667BBL01 KECC667BBL02 KECC667BSS00 KECC667BSS01 KECC667BSS02 KERS205TBL4 KERS205TBL5 KERS205TBT4 KERS205TSS4 KERS205TSS5 KERS205TWH4 KERS205TWH5 KERS807SBL04 KERS807SSS04 KERS807SSS05 KERS807SWW04 KERS807XSP01 KERS807XSP02 KESK901SSS07 KESK901SSS08 KESS907SBL05 KESS907SBL06 KESS907SSS05 KESS907SSS06 KESS907SWW05 KESS907SWW06 KESS907XSP01 KESS907XSP02 MER7662WB0 MER7662WB1 MER7662WB2 MER7662WB3 MER7662WQ1 MER7662WQ2 MER7662WQ3 MER7662WS0 MER7662WS1 MER7662WS2 MER7662WS3 MER7662WT0 MER7662WW0 MER7662WW1 MER7662WW2 MER7662WW3 MER7664XB0 MER7664XB1 MER7664XS0 MER7664XS1 MER7664XW0 MER7664XW1 MES5875BCB21 MES5875BCS21 MES5875BCW21 MES8800FZ0 MES8880DE0 MES8880DH0 MES8880DS0 W5CE3625AB00 WDE350LVB02 WDE350LVQ02 WDE350LVS02 WEE730H0DB0 WEE730H0DS0 WEE730H0DW0 WEE760H0DE0 WEE760H0DH0 WEE760H0DS0 WFE361LVB0 WFE361LVB1 WFE361LVD0 WFE361LVD1 WFE361LVQ0 WFE361LVQ1 WFE361LVS0 WFE361LVS1 WFE361LVT0 WFE361LVT1 WFE364LVB0 WFE364LVD0 WFE364LVQ0 WFE364LVS0 WFE364LVT0 WFE366LVB0 WFE366LVB1 WFE366LVQ0 WFE366LVQ1 WFE366LVS0 WFE366LVS1 WFE366LVT0 WFE366LVT1 YGY397LXUB04 YGY397LXUQ05 YGY397LXUS04 YGY399LXUB04 YGY399LXUS04 YIES426AS0 YKERS205TS4 YKERS205TS5 YKERS807SB03 YKERS807SP03 YKERS807SP04 YKERS807SS03 YKERS807SS04 YKESS907SB04 YKESS907SP04 YKESS907SS04 YKESS907SS05 YMER7662WB0 YMER7662WB1 YMER7662WB2 YMER7662WS1 YMER7662WS2 YMER7662WW0 YMER7662WW1 YMER7662WW2 YMES8800FZ0 YMES8880DE0 YMES8880DH0 YMES8880DS0 YWEE730H0DB0 YWEE730H0DS0 YWEE730H0DW0 YWEE760H0DE0 YWEE760H0DH0 YWEE760H0DS0 YWFE361LVB0 YWFE361LVB1 YWFE361LVQ0 YWFE361LVQ1 YWFE361LVS0 YWFE361LVS1 YWFE366LVB0 YWFE366LVQ0 YWFE366LVS0. Our mission is to become the #1 source for all your appliance part needs. We will attempt to process your address change, cancellation and order change as quickly as possible. However, we cannot guarantee that we will be able to provide this service. Please review your order for accuracy before submitting it. The time frame depends on your location and is determined by the Post Office. Tracking information is accessible once the item is delivered to the post office or picked up by UPS. These charges are not refundable for all correctly filled orders. Please review the entire listing carefully and make certain you are ordering the part you need. Please note that appliance manufacturers frequently update their parts without warning. All items must be in a brand new (without signs of installation) and resaleable condition. All parts are inspected for signs of installation upon our receipt of them. The decision is made based on our assessment of the part and whether it can be resold as "used". In no way shall General Appliance Parts be liable for any loss, damage, fire, explosion, injury, including any incidental or consequential damages, or death as a result of ordering and/or installing any parts from our website or from the results of any action taken due to reading information found on our website. The information is provided as a courtesy to our customers to enhance their understanding of their appliances, it is not to be taken for instructional purposes on how to repair their system. General Appliance Parts suggests having all parts, accessories and equipment installed by a qualified heating and air conditioning technician. If a customer attempts to install a part, accessory or equipment, he or she should have a thorough understanding of electricity, reading wiring diagrams and the work to be performed. In no way shall General Appliance Parts be liable for any loss, damage, injury, including any incidental or consequential damages, or death as a result of ordering and/or installing any parts from our website or from the results of any action due to reading information found on our website. The item "Maytag KitchenAid Jenn-Air Range Radiant Heating Element AP6018366 PS11751668" is in sale since Monday, July 31, 2017. This item is in the category "Home & Garden\Home Improvement\Heating, Cooling & Air\Furnaces & Heating Systems". The seller is "generalapplianceparts" and is located in Louisville, Kentucky. This item can be shipped worldwide.